The majority of teachers I talk to about Project-based learning love the idea and understand that students don’t learn the critical thinking skills they need from lecture and worksheets. Project-based learning allows students to use technology, collaboration, and advanced thinking to work on a real-world project that they can get excited about. Many students get so excited about PBL that they do extra work at home – without the direction of the teacher! My students are too low. I’m going to address ability level and how to differentiate instruction for students during PBL in a blog post later this month because I think it IS a valid concern, but today I’m going to focus on student behavior. These two topics are intertwined, because struggling students are often the ones that have trouble with behavior during class. If kids are engaged, they are less likely to misbehave. I use a lot of Math project-based learning activities that have printable guides and sheets to help students organize work. These are meant to give the teacher and students the tools they need for the PBL. They are the “bones” of the project. You cannot hand students a packet and expect them to be engaged. Take the time to plan each day of your PBL with a fresh activity that will have students asking A LOT of questions. Each part of a PBL activity should include technology, discussion, and creation. If your students are choosing their careers for their personal budget PBL, have them watch a video like this one where kids find out about different careers. Have students discuss the careers their relatives have, and have them pick one to interview about their career after school. One of the common discussions we have during this step of the PBL is why teachers and military are paid so little. Allow students to do in-depth research on questions they have, such as what type of education they will need for a specific career, or average starting income for a career not on the list in the project. Each day should have a specific task or topic, but students might be working towards it in a different fashion. They might be off researching a question they have about the topic, which is totally ok. Leave room for these “tangents”, because they are what keep your students interested in the topic. In the past, teachers have used projects as a chance to let the kids go wild while they graded at their teacher desk. This is not project-based learning! Project-based learning is also not a time for you to lecture to your class. Take the time during PBL to walk around and talk to your individual students. Don’t wait for the “usual suspects” to raise their hand and ask for help. Engage each student in discussion and ask them questions about the topic. This allows you to build relationships with your students, and let them know that you’re nearby paying attention to what they’re doing. You can engage struggling students with the right questions & tasks. Target the students that you know struggle in class. Plan out the questions you’ll ask these students and be prepared to listen to what they have to say. During the same PBL mentioned above, students chose a car to add into their budget. I found that one of my special education students loved Ferraris. I set him up on the computer to “build” his dream Ferrari and bring me the total price. This particular student struggled with adding, subtracting, multiplying, and dividing. When he brought his total price to me, I pulled him back to my small group area and we worked together to divide the cost of the car and find the car payment. Obviously it was something outrageous! We looked at how much he made every month in the career he chose and I asked him if he could afford it. He knew that he couldn’t afford it- pretty good critical thinking skills for a special education student at a 1st grade math level. He then did the research to find a more affordable car. This student also happened to be my biggest behavior problem, and I got more work out of him during this PBL than I had all year. I also learned something new about this struggling student. I was able to find three books about Ferraris and other sports cars at his reading level and caught him reading them during lunch. That’s the moment when I realized that project-based learning lets students express their different interests and allows you to get to know them better. Allow students to get off task. Oooh controversial! In PBL, it’s ok for students to get off task (but not off topic). Think about the Ferrari example above. The way that I found out about this student’s interest in Ferraris is because I overheard him talking about everything he knows about Ferraris with his partner. He wasn’t doing the math or research he had been given. He was off task, but not off topic. As you’re walking through your classroom gritting your teeth at the little side-conversations, stop and ask yourself “Is it helping them get to the end result I want?” You’ll be surprised how often the answer is yes! Have a lot for students to explore. We all have those students that are done early with everything. My biggest pet peeve is when a student rushes through everything so that they can be done and just sit there doing nothing! Is doing nothing really more exciting than my assignment? I suppose sometimes it might be, and that’s something we really need to work on as teachers. During project-based learning, we want students to ask questions and dive deeper into the topic. Have computers, books, and other media available so that no student is ever really done. If a kid is really into something, they won’t stop and just sit there. They will seek out more information on their own. This is a part of learning that needs to be instilled in students because they aren’t always allowed the freedom to explore a topic. As you begin project-based learning in your classroom, don’t forget to give yourself a break. If it doesn’t go the way you wanted it to, revisit some of these tips when planning the next activity. Don’t give up on PBL after the first try! It takes a lot of training for the students to know what you expect during PBL. It may be very different from what they’ve done in the past, and it’s going to take time. And as always, e-mail me with any questions you may have. 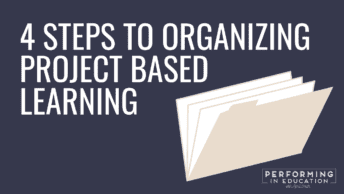 I’m happy to help you and your students have a great experience with PBL!